Our incredible silver arrival sale is on and a fabulous giveaway! Hi friends!! 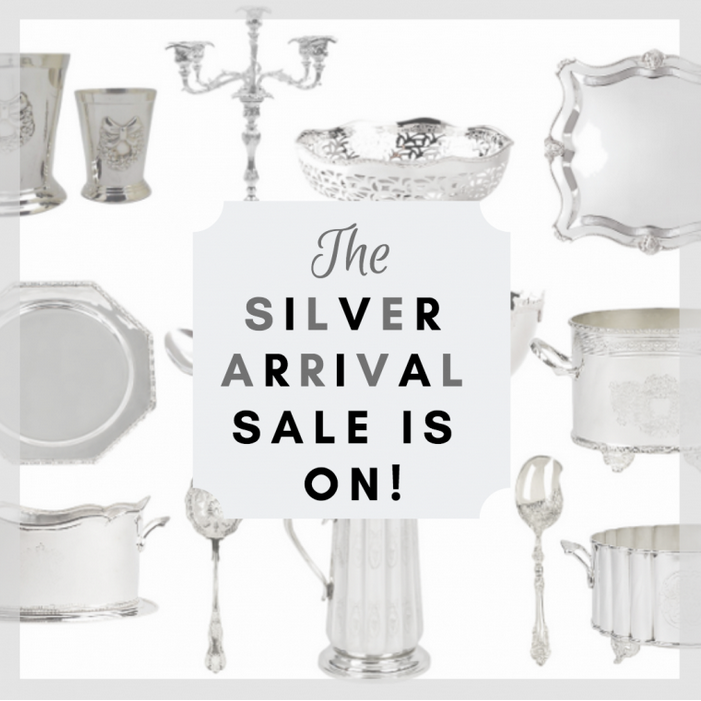 We are finally having our silver arrival sale, this was a long time coming! 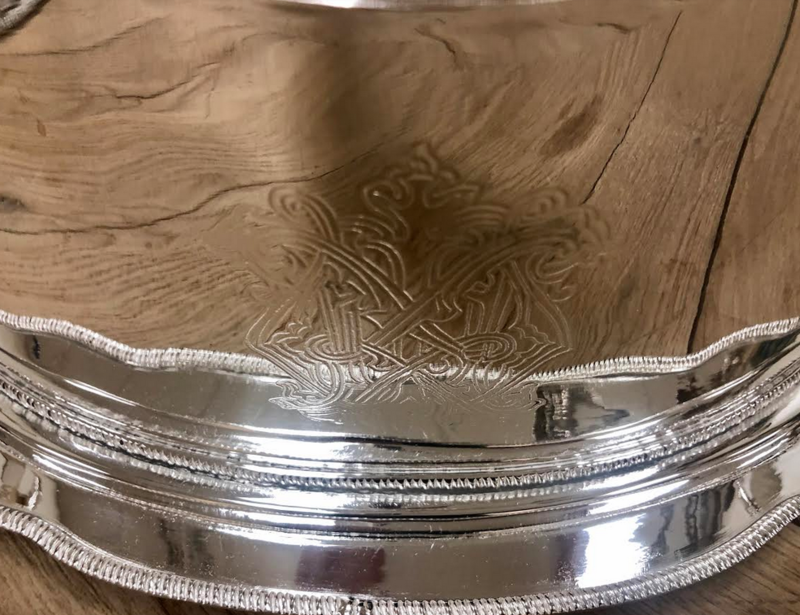 With the blur of the Christmas/holiday season, we just were not able to devote time to this magnificent shipment of silver as it deserves so we decided to wait until after the holidays when things calm down a bit. 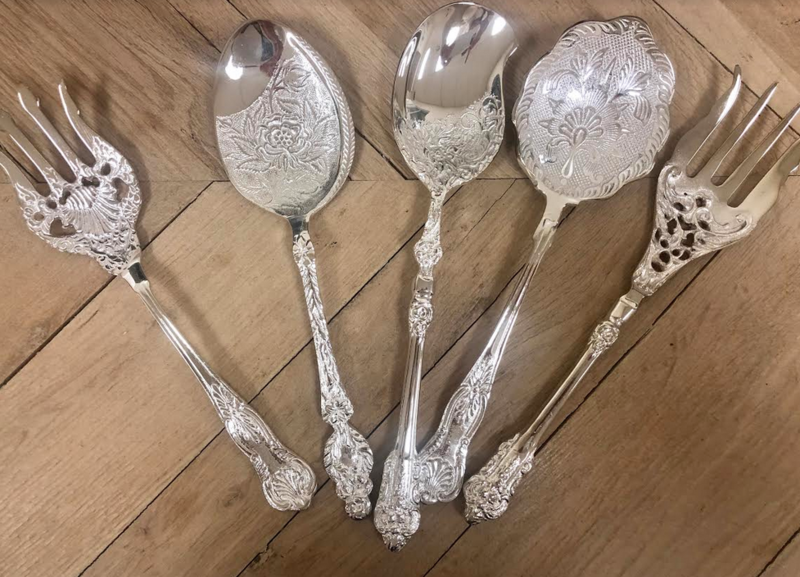 It is hard to find elegant traditional silver pieces like these, it’s normally either finding something antique which is either very expensive or in poor condition OR the silver pieces of today are more modern with less detail. So I have taken great pleasure in watching this carefully curated collection grow. 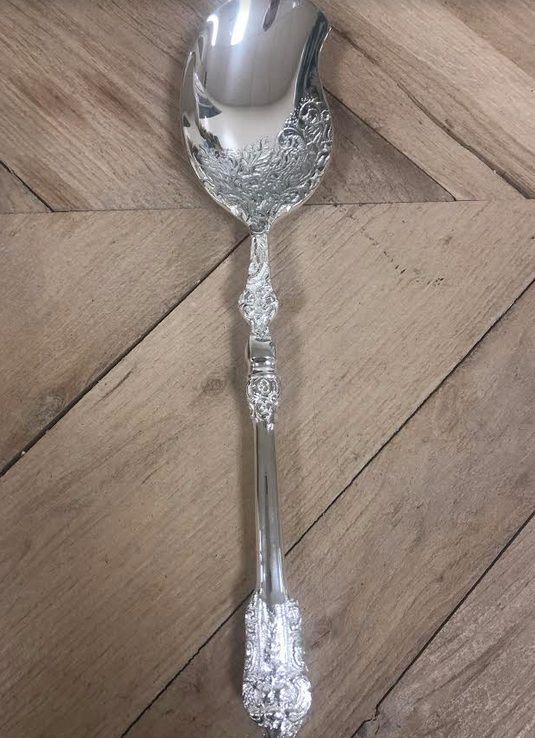 This below is our sample which has sat in our warehouse for a few years but it shows the beautiful workmanship! ITEM 6. Got in a huge new round of serving pieces. These really step up your hostessing game and add so much to any table. Truly elegant pieces from a bygone era, you just don’t see these much anymore! Buy 6 or more and get 1 free! ITEM 7. Our other square scalloped style of mint juleps has arrived in two wonderful sizes. Both make a beautiful small bud vase, but are also great for things like makeup pencils, brush holders, pen and pencil holder for your desk. And of course they are stunning filled with small clusters of flowers. ITEM 8. 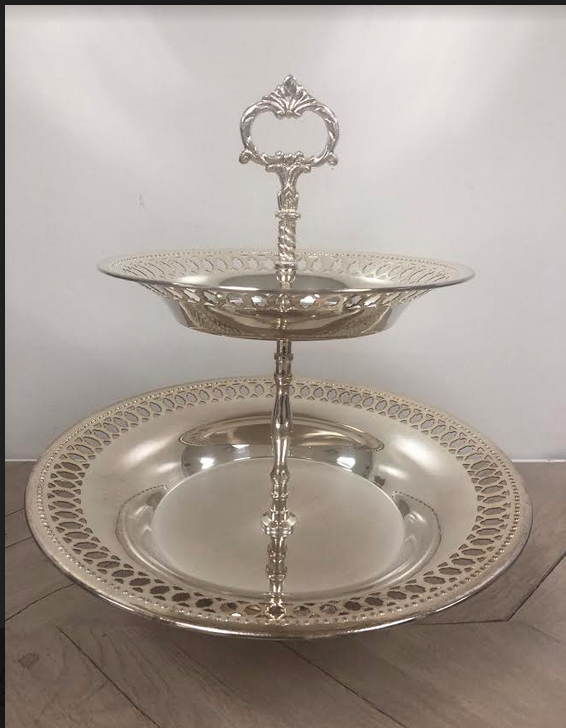 This in one gorgeous two tiered silver server, so pretty for things like sandwiches, antipastas, fruit, candies and cookies and more. A beautiful must have for any entertainer. 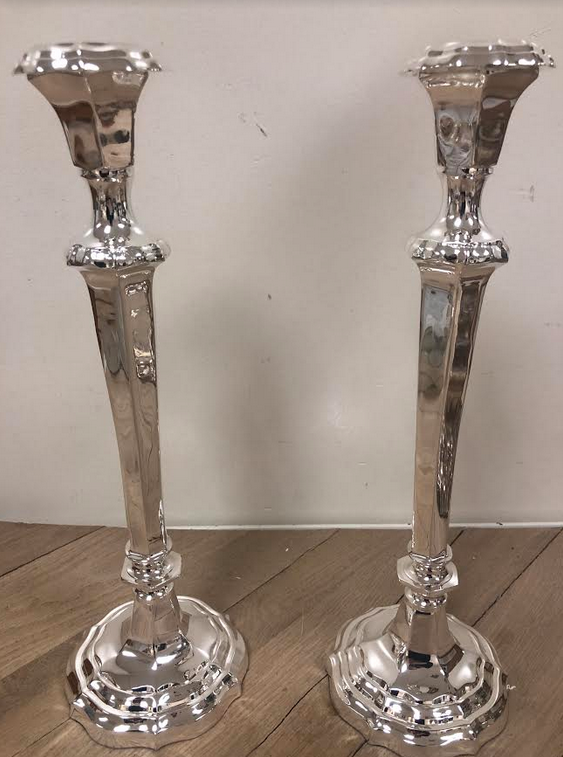 ITEM 14 Just got in these incredible heavy silver candlesticks. 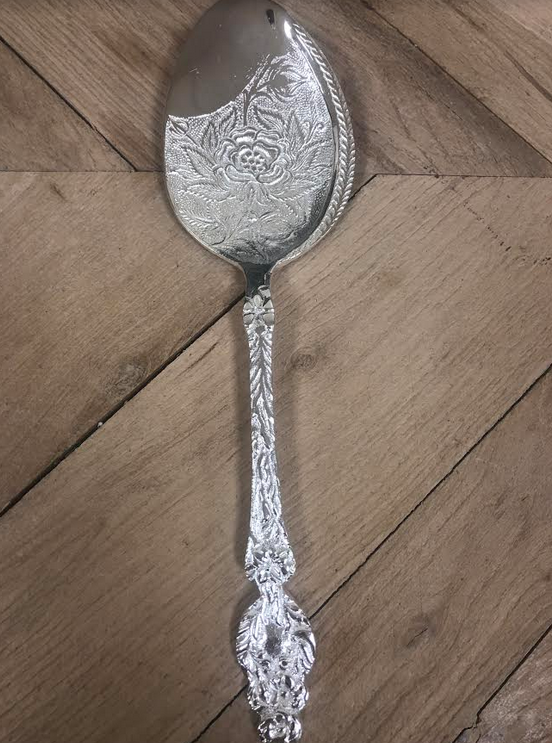 Simply beautiful, wonderful to use on a dining table or a buffet or console. Very decorative, offered in two wonderful sizes. 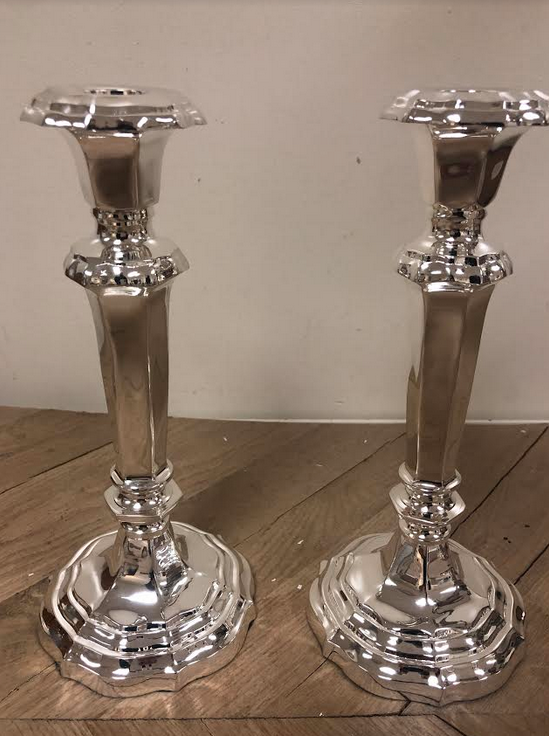 One lucky winner will win a pair of the gorgeous new medium candlesticks!! Just leave a comment on this post telling us what your favorite item is and how you would like to use it. That’s it, will announce a winner on Sunday morning! I love the small square silver pieces that can be jumbled up in multiples. So clean and the beaded edges! Oh! Beautiful collection…LOVE the mini table lamp…perfect for my dining room table! 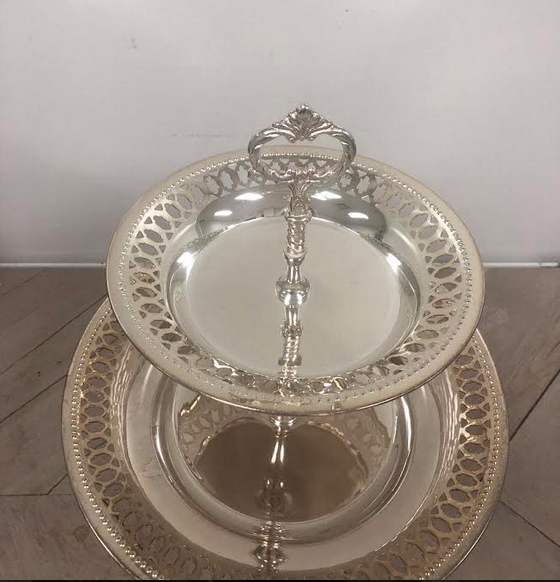 I love the trays and the candlesticks are beautiful- elegantly simple but could look fabulous with formal table decor! Everything is gorgeous- love this post today!! Can you share if the beverage tub “sweats” or if a liner protects moisture buildup? 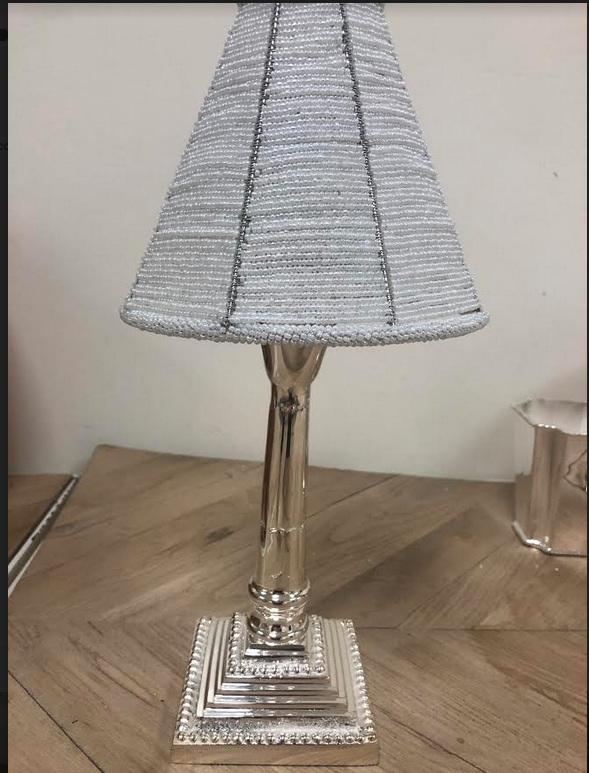 My favorite is the mini table lamp with beaded base. Love them! All of the silver is beautiful and I already have several pieces. If I were fortunate enough to win, I would put the candlesticks on my dining room table. I want the new bud vases.! Great size and shape for a variety of uses. Can you share if the beverage tub “sweats” with ice and cold beverages or does it have a liner? I like the tall Candelabras best. So elegant! Love the scalloped mint julep cups for my Kentucky Derby party! So fabulous – it’s hard to choose a favorite. 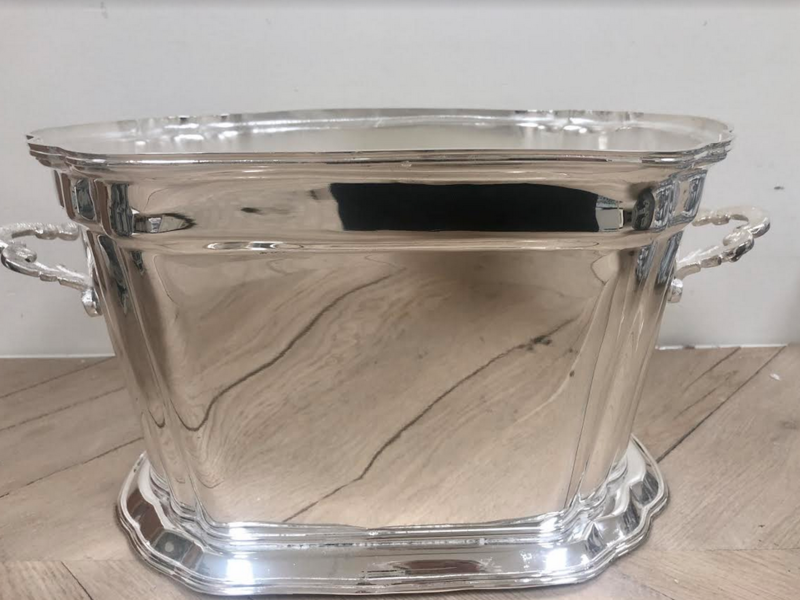 I’m thinking that the square bud vase / mint juleps would look amazing in multiples running down the dining table filled with flowers and foliage, so elegant. Although I must admit we enjoy our mint juleps in the traditional cups, I also love to use the cups for small flower accents! My choice would be to collect more cups and I would love to own that #5 tray. #11. Would use it to serve wine or other beverages. Great size! My favorite are the table lamps. I would love to have 10 of them they would look great on any table for any season. Thx Tina for a wonderful boat load of goodies! My favorite is the candelabras, they are beautiful. LOVE LOVE LOVE your candlesticks! I would perch a small teacup and saucer on top of them with a candle burning in side the teacup…(with a little help of poster putty to harmlessly secure) These would be delightful for a luncheon, bridal shower or tea party. So may ways to use these fabulous candlesticks! I love the scalloped mint julep cups. I have a narrow dining table and am always looking for ways to display flowers without overcrowding the table. 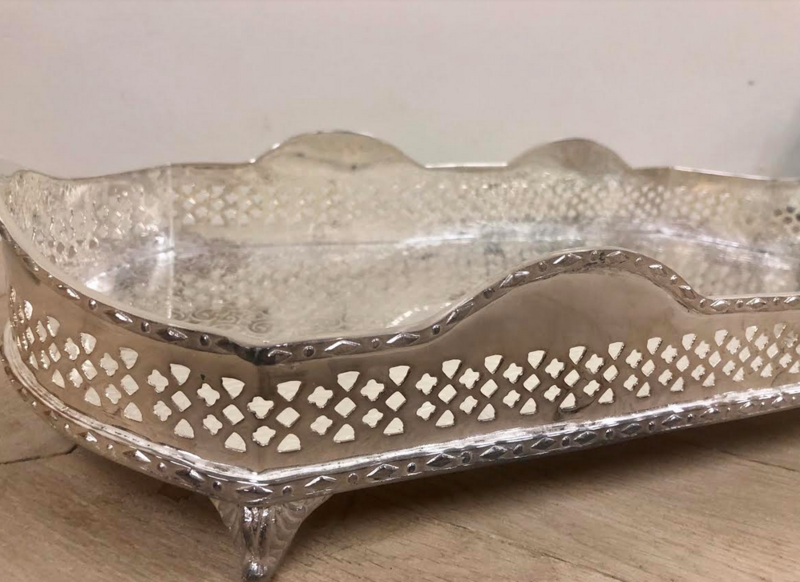 Just LOVE mixing your new silver pieces in with the old trays I inherited from my Grandmother! It makes such a beautiful table setting. Those new julip cups are on my wish list! Item 12 is the planter I would love to have! I am enchanted by your pierced silver. Absolutely to die for! Love all of these!!! Absolutely gorgeous! Will be placing order!!!! Love. Love number four. It would be wonderful filled with flowers on my table!! Beautiful silver pieces all ! Love the mint julep cups!! Love the medium size candle stick holders. Perfect size for my condo and dining area. Each piece is beautiful and has so many issues. I have a grouping of different size candlesticks on the dining room table and a new pair would be a perfect addition. I love almost ALL of your merchandise. I have followed you from the beginning, and I think that the site is becoming WAY too commercial. We all know that you have a wonderful shop! I would like to see more design focus, the way it used to be!! Great pieces! And my favorite are the candelabras of course. They are magnificent! The serving pieces. I like to mix patterns in all my serving pieces. I use my sterling silver and silverplate daily. I am just as important as company! 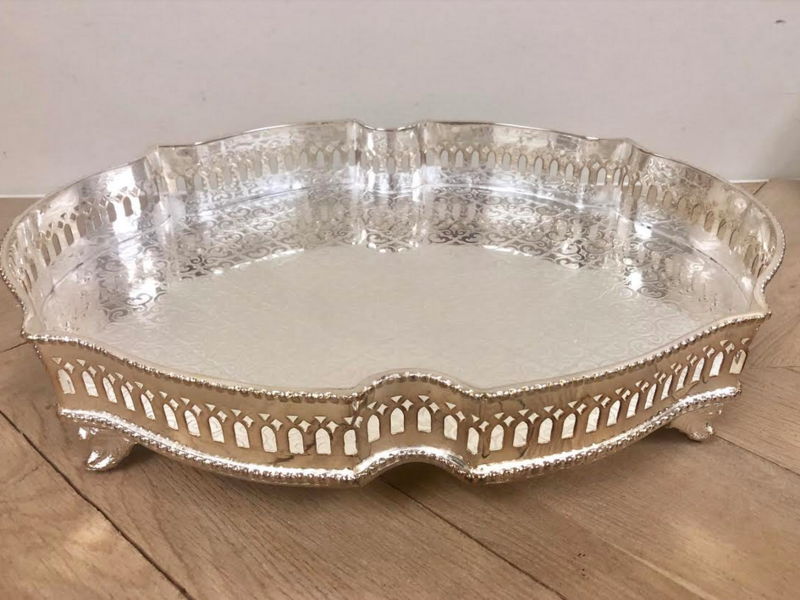 As a big fan of blue and white, and loads of silver splashed around my home, I am strongly considering the purchase of another large tray…can never have too many! I love the mini lamps and think they look so warm on the dining table…. The candelabras are stunning and I have enjoyed mine so much! Love the table lamps and using for a dinner party this week! I love the candlesticks and would love to include them at my daughter’s bridal shower! Love the #1 tray. All silver pieces are beautiful. The mini silver lamps remain a favorite. The beaded lampshades add a lovely touch. What beautiful silver! My favorite is #12. I would fill it with moss and grasses and tuck in a beautiful brown vintage rabbit for my Easter table! Item #5 is my favorite tray. I know where I can put it in my dining room on my sideboard. Add a decanter & cordials and it’s done! The lines..clean lines of popular large planter for my mini key lime tree. The darling beaded lamp for desk. The awesome candelabra for my entry or island. I love the oval shape of item #5. I would use it in my bathroom and fill it with my antique perfume bottles. I like all of the trays and the cooler/planter. I love #5, the pierced tray. It is one of my favorites but it is so difficult to only choose 1!! I love them all! Love the idea of using the mint julep cups to hold make up brushes! So many ideas for so many beautiful items: 1. 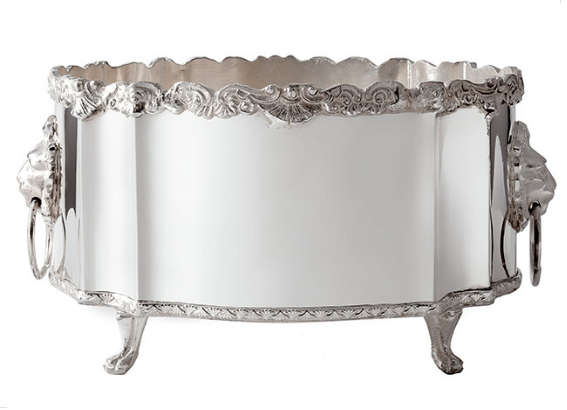 Two tiered silver server, use in the bathroom or bedroom to display and store jewelery: 2. 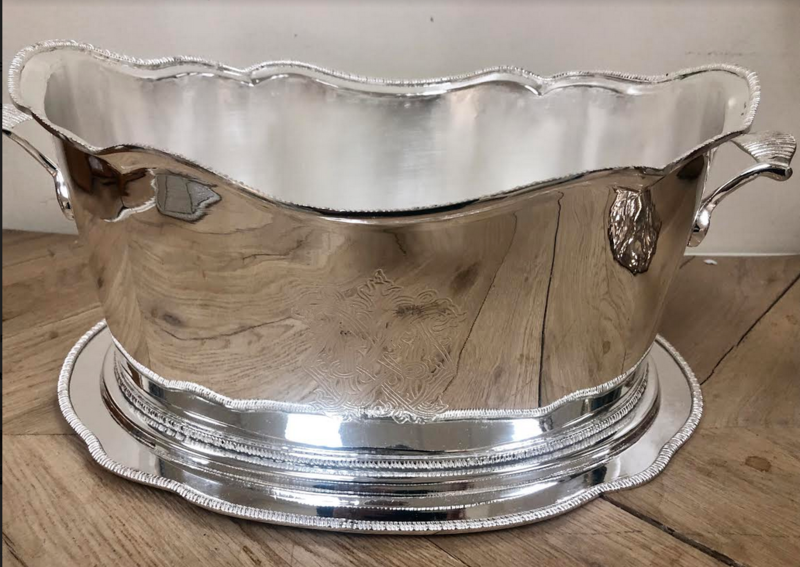 #12 planter with the lion heads on the side – I would use 1 on each side of a mantle and place freshly picked magnolia leaf bunches to casually drape over the side still revealing the beautiful edge work; Serving pieces – buy all to use as gifts for friends. I love # 1 & 4, but especially love #11. Item 4 is so beautiful! I HAVE to have it! 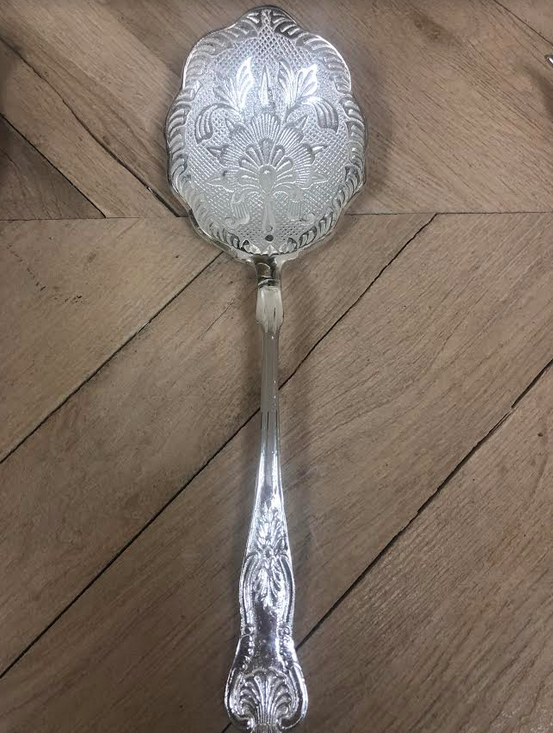 My husband has collected English Georgian Silver and I love to polish silver! I have purchased to Candlesticks with the beaded shades and just love them on our kitchen table as we eat dinner!! Very cozy!! Love the footed tray. 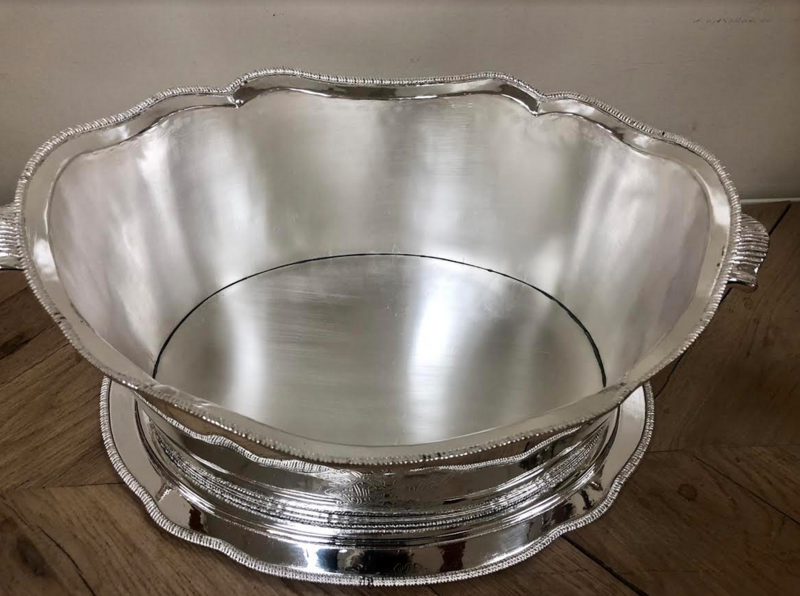 It would be perfect for serving mint juleps on a hot summer afternoon. Item #4 is the perfect planter for a sculptural jade plant. I will place it in my entry. IT’S ALL SO VERY PRETTY!! So many beautiful pieces, but I’m actually in love with #2. There are so many ways to use this small lovely bud vase/mint julep cup. Would like to order a few. 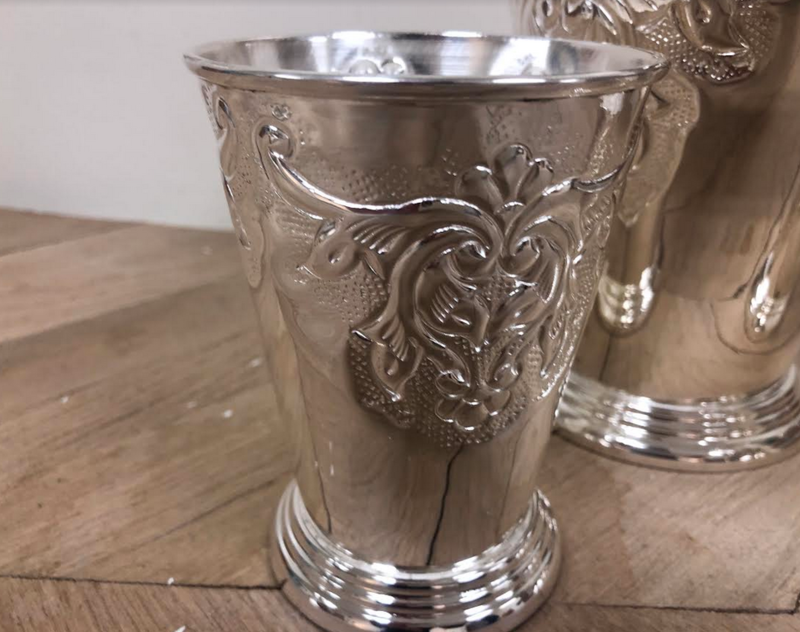 The embossed mint juleps are my favorite……for either a sweet and icy mint julep or to use for a big fat hydrangea; you can’t go wrong with these little beauties! I love the lion handled planter. It would look lovely with orchids in my entry. Love the planters/coolers….of course I would use with ice to cool my favorite wines at book club! I love Item 1 and am placing an order now! Picturing white hydrangea’s, from my garden (stems cut low), in the square scalloped mint juleps. Gorgeous! Item# 12 is absolutely beautiful! I love the detail around the top and the footed feet! It is fabulous! Love the beautiful serving pieces. What an elegant addition to my dining room tablescape! Hi, what are the measurements on Item 2 mini mint julep? Was looking for the mint juleps with the horseshoe motif? Love #2, in my living room with flowers from my garden! I love the medium candle sticks. They would be used on my sideboard that I got at Christmastime. So nice looking. 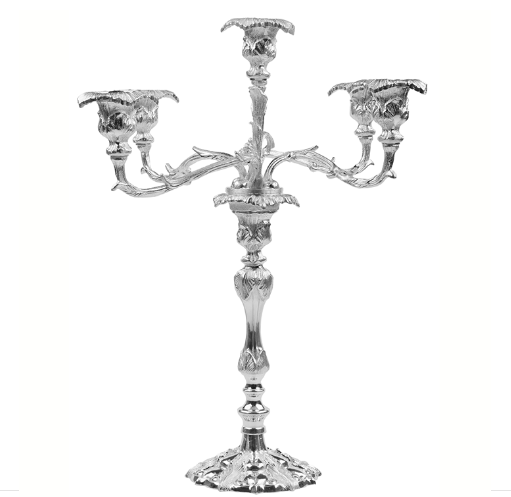 The candelabras would be stunning on my dining room table! I love the gallery tray. 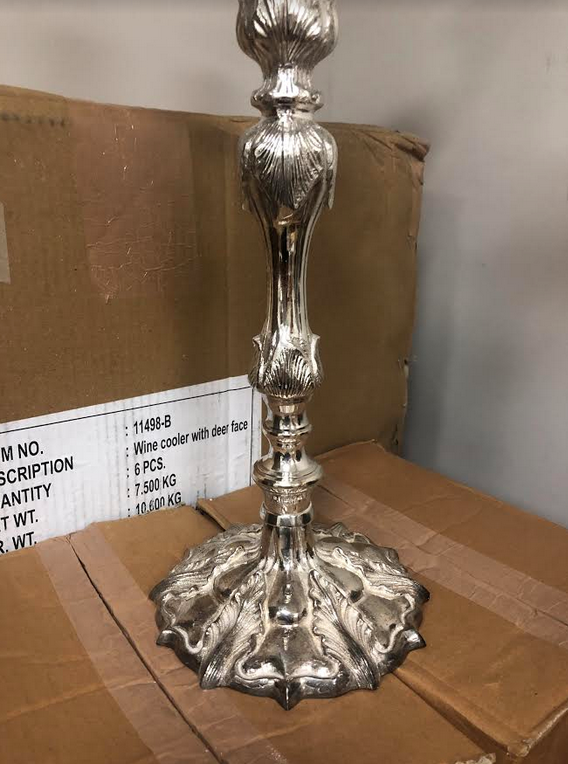 Would use it in the center of my dining table with various sizes of candlesticks (crystal as well as silver and mercury glass), then run some rice lights or some silver beads around the bottom of the tray for accent. 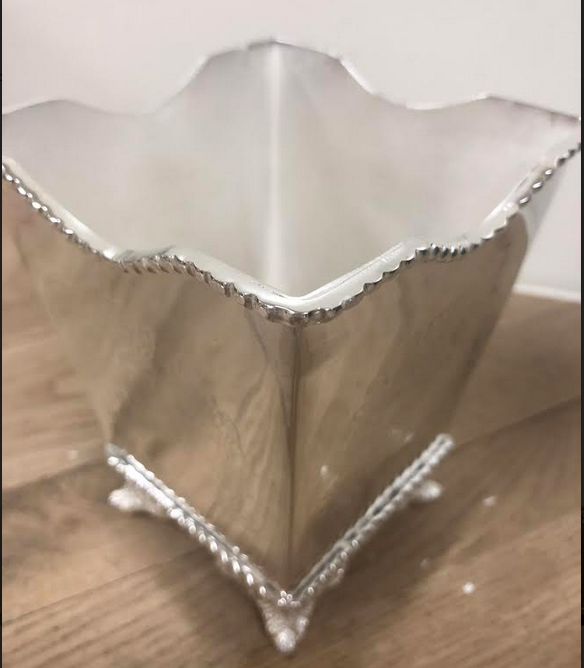 What beautiful silver pieces you have! My favorite is the silver bud vases. I would like to use them in my master bath on the counter with orchids in them. Sooo beautiful! I am so happy I found this blog!! 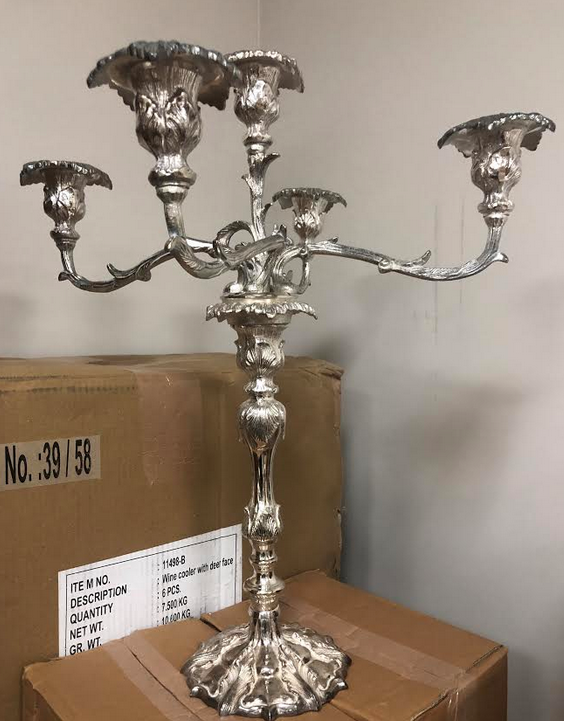 My favorite items are the silver candlesticks. I am now collecting candlestick holders and have them placed on a tray in the middle of my dining table. We light the candles for every family dinner. I may have to order a new silver tray to put them on. I am so happy I found this blog!! My favorite items are the silver candlesticks. I am now collecting candlestick holders and have them placed on a tray in the middle of my dining table. We light the candles for every family dinner. I love the planters, especially #12 and the candle sticks. Both would look lovely on the mantle filled with white flowers and blue candles. 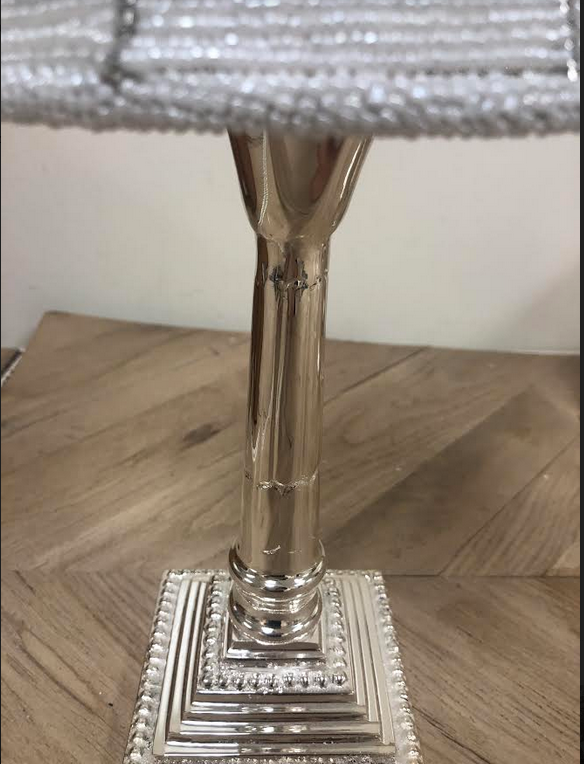 Love the fabulous silver table lamp!! I would use it on my white marble kitchen island when serving appetizers and wine! #4, the planter/tub cooler has always been my favorite. Great for my parties! Love the beautiful tray, item 1. A must for entertaining…. Tina, I don’t mind that the pictures aren’t taken by a professional: if the items look great taken by a cell phone, then they are going to be even better in person! 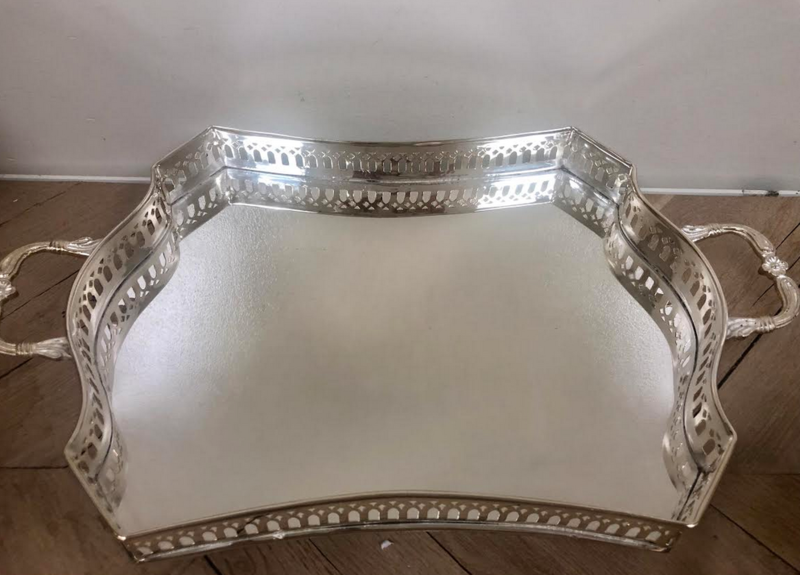 Love Item #10, this tray is perfect for my newly renovated main bathroom, and you can’t beat the price! 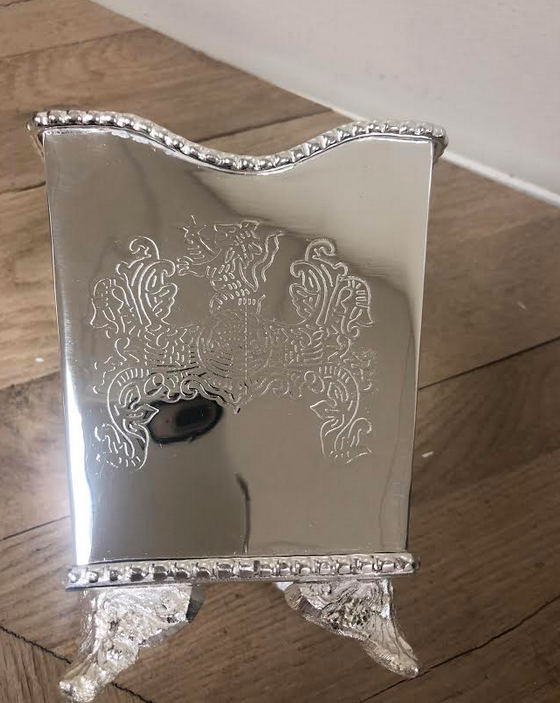 I’ve seen chrome vanity trays online from $200-450(!! ), so why would I buy a tray in chrome when I can have silver on my carrara vanity for half the price? Would also add one of your darling mini table lamps, adding a battery-operated tealight rather than a candle for the prettiest night light ever! 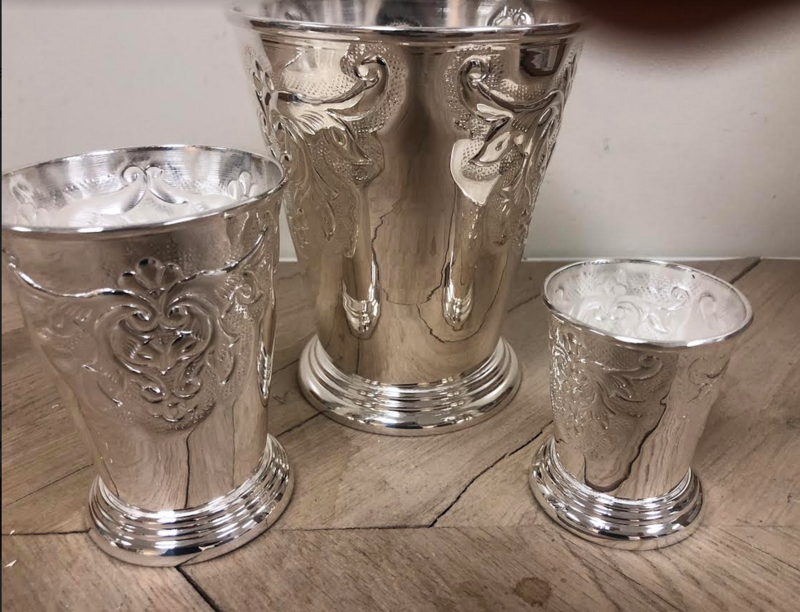 The elegant etched mint julep bud vases will gracefully greet my guests with seasonal flowers on the nightstands. Item #4 Beverage tub/planter is exquisite! 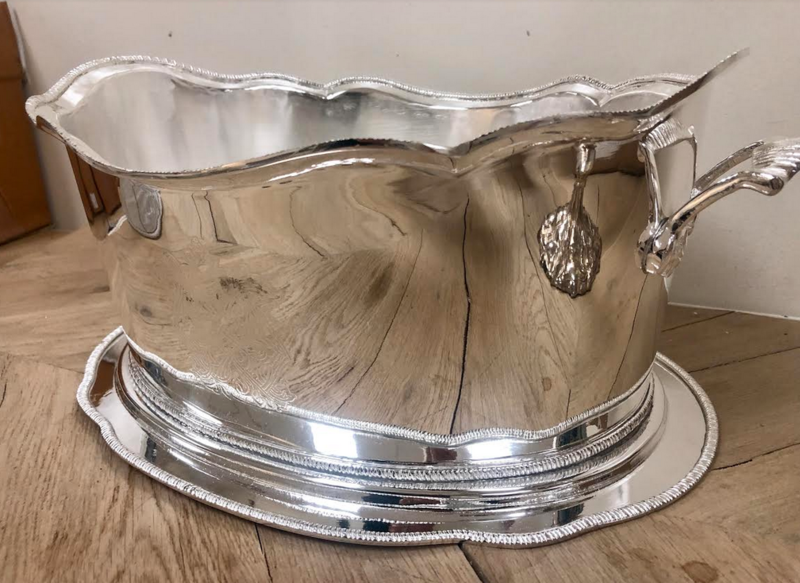 This item would look great on my hall console table with a beautiful plant in it Or a Beverage tub greeting guests to drop their wine bottles into upon arrival. Let the party begin. 🍷CHEERS!!! While I love the scalloped mint juleps, my favorite has to be the cooler/planter…perfect for fresh arrangements that I like to have each day!! Fresh flowers are like candy for the soul!! The mint julep containers are my favorite. Love, love this collection! I am particularly intrigued with the trays and candlesticks! The planter/cooler is fabulous. I can see it used for water bottles during parties and it a beautiful orchid planter as a centerpiece for a shower or party ! I love them all! So hard to choose but love item 4! It would be gorgeous for so many uses! Love the elegant details on the beautiful trays! Love the table lamps so much! Also love the last silver planter. Heck, I love it all! 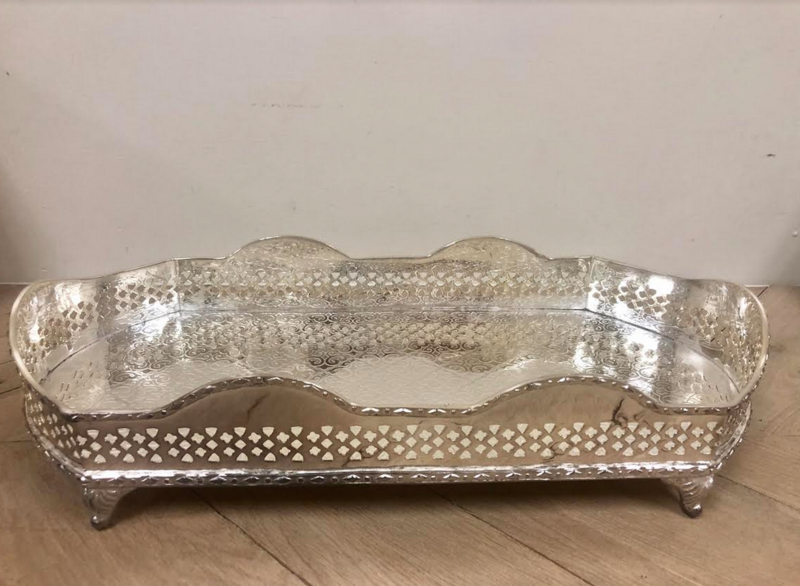 I love the tray with the pierced and scalloped edging. I would use this on the vanity in my master bath. I love all of the silver trays. Simply gorgeous! Love love love the new candlesticks! I would use with my glass hurricane globes. Everything is just beautiful! Always love seeing your silver pieces. I love the candlesticks & can see them on my dining room table. I love the mint julep cups. I would like to use them at my spring luncheon next to each place setting filled with flowers. I love everything! But, item #8 is my favorite. It would be perfect for a buffet to serve finger sandwiches. I love the beverage tub/planter! We have a big family, and this would be perfect for holidays in our new house! I LOVE the candelabras!! 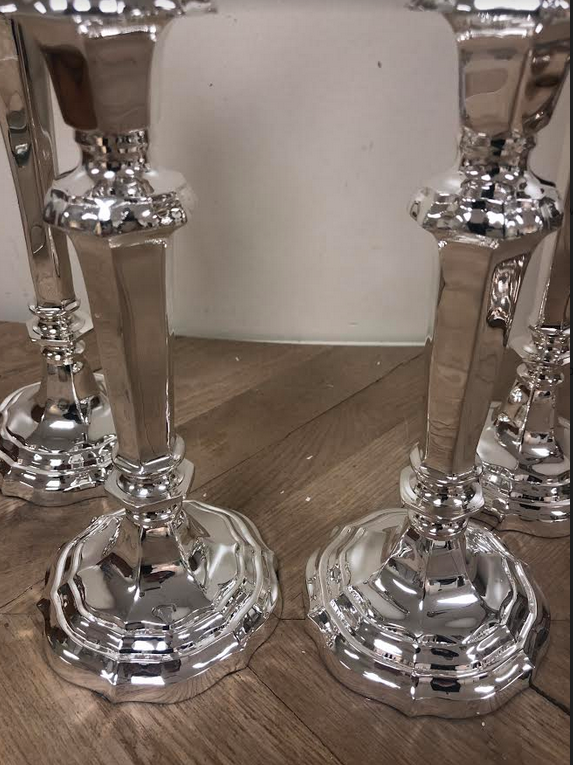 I hope to add these to my dinnng room, a perfect addition to my growing silver collection!! I like the candle sticks. I would put them on the top of the china closet. Tray #5! I would love to use this on my kitchen counter to wrangle all the usual staples I keep at arms reach, olive oil, vinegar, salt, pepper etc. I would love to own #4. I have admired it’s size and beauty for sometime. So gorgeous!!! I actually love these candlesticks. Simple, yet elegant! Wow, hard to pick one item! Love the planters/coolers and the candle sticks! I would use the cooler for entertaining and have bottles of wine chilling. The candlestick would be beautiful on my dining room table. Thank you, beautiful items! That romantic mini table lamp is calling my name and I absolutely love the shell spoon! Simply adore all your items but I am adding to my collection of the table lamps! The candlesticks would look stunning in my bathroom surrounding the tub. So beautiful! The trays are exquisite! And I love the Mint Julep glasses. I love the tiered silver server! Love item 11, the double cooler/ beverage holder. Would be wonderful on the kitchen island during a casual drinks party, with rosė and white wine on offer. Love the clean modern lines! Very pretty. I love, love, love the candelabra! I can just see it on our baby grand piano…how very elegant this would look. It’s hard to choose just one thing, I love all your merchandise, but those serving trays are to die for! You are so correct in saying that your collection of silver is far and beyond in selection, style and price! Love it all, but pick that best selling planter. It can be used in so many ways….plants, mail, fruit, table centerpiece, spices, etc. It is so hard to choose a favorite,however my favorite is item#13. My daughter recently got engaged and these would look devine on a 20 foot table amongst beautiful bouquets of flowers 🌸 . Item #9 The assorted mint juleps are at the top of my list because I could use them in many different ways as you mentioned. From flowers vases to a classy holder for my make-up brushes on my vanity. Their uses could be just endless and oh so lovely. I am always thinking of party favors for the small one for a ladies luncheon at each place setting. What a great way to remember a special occasion! I have to say that while everything is gorgeous, I’m absolutely smitten with those gorgeous candlesticks. Elegance personified!! The mini table lamps are lovely and would look good on either my dining room or sun room table. Tina, my favorite is the two-tiered silver server. I purchased this from you earlier and absolutely love it! I fill it with cheese and fruit when we have guests over so they can munch before and after dinner. I’ve received SO many compliments! I love the two tier silver server. It would be a lovely addition at the table for tea parties! 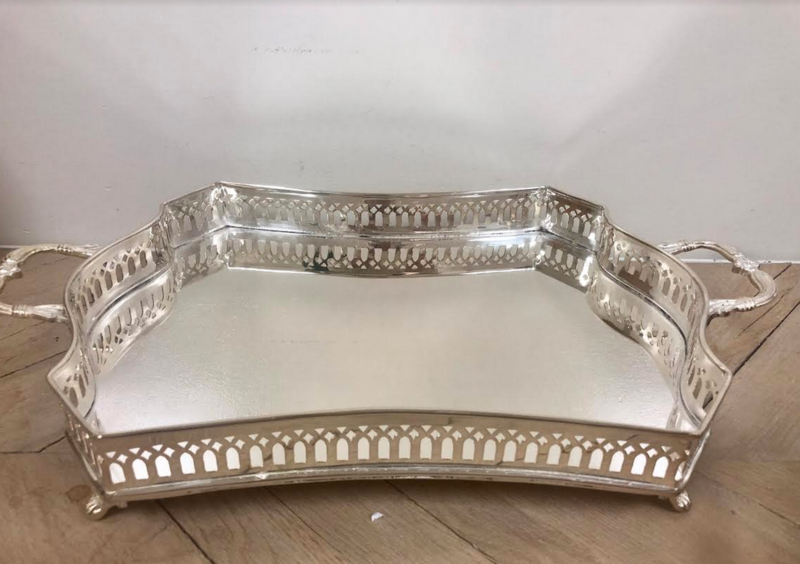 I love all of your silver pieces but the silver handled tray is a must for me:) I can see the 2 tiered serving piece on my dresser holding my bracelets and jewelry! They are all beautiful but the silver tubs are stunning. And the new lamps are very pretty. Love the trays! Pretty on display or serving food and drinks! Wow, everything’s incredible.! I love all of it…my favorites are #12, the gorgeous Planter.. Many uses, rolled hand towels or sit the potted orchids until full inside, that would be a beautiful presentation., rolled napkins for brunch/buffet. Wish I had this lovely piece..
#44, The Beverage Container, amazing! Uses are endless. Item 2-Mint Julrp Bud Vases are so perfect for bouquets as you said & perfect on a buffet table.. or on a desk with “Readers,” if you need, magnifying glasses, pens, etc. So much. They speak for themselves & as you said, it’s very difficult to find workmanship anymore that makes a statement. I just can’t get over them! #14-Candlesticks, gorgeous. These are the sort of things One looks for and you can never find . I would love to have the tall and medium to mix together. 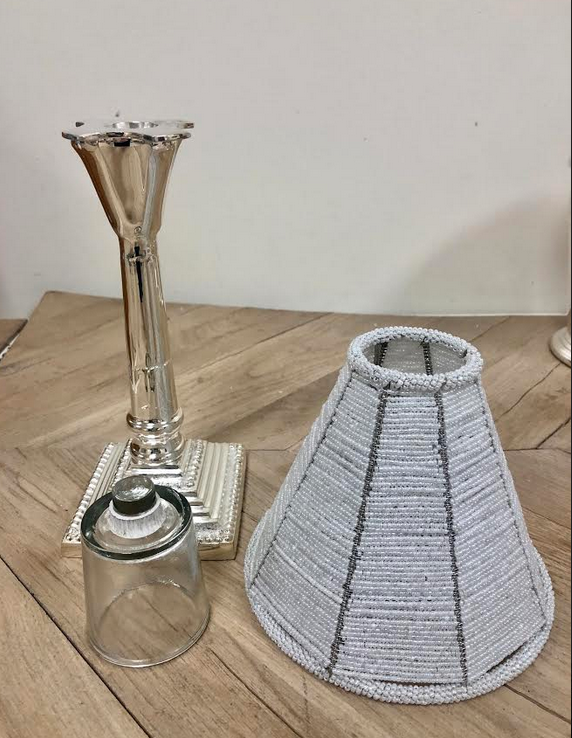 Love all the new silver pieces, but really love the mini-table lamps. I could see one giving off a pretty light in a guest bathroom, during a party. I love ALL the small mint juleps! So many uses. I can’t wait to get them! Love them all. I especially love the mint juleps and would put flowers in them. The candelabra is so beautiful. I would love to own a pair! I really like no. 13, the votive lamp. I think that besides being used in a dining room, it would be great in a powder room. Love you offerings! I’ve purchased item #7 to use on my desk at work. Good bye to my ordinary pen holder, Hello to my new silver pen holders! Instant refresh for 2019. Thank you! 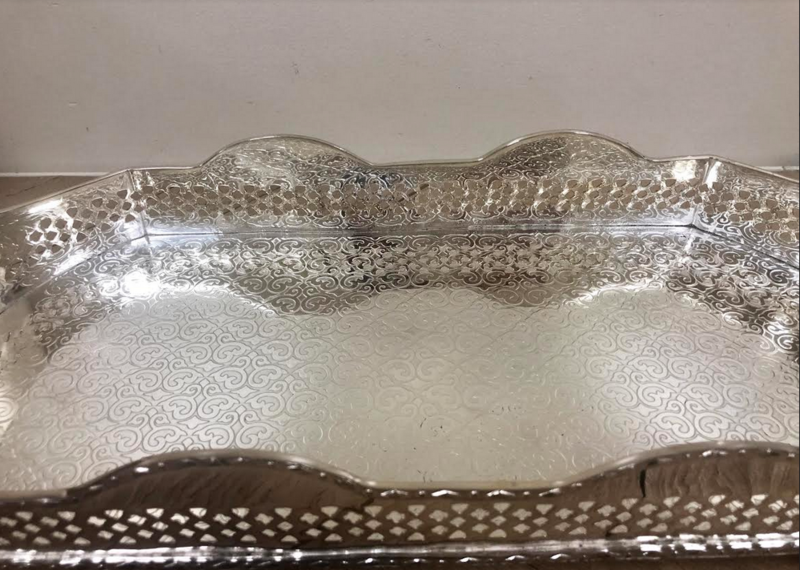 #5 as a tray on my vanity…love the shape! I adore the embossed mint julep cups, I can see a cluster of 6 with sweet nosegays. Love Item 12, beautiful detailing! Would use for extra hand towels in powder room. #10 Tray is stunning! I would serve my Buche de Noel on it. As a big fan of shell patterns, I also love the silver serving pieces. 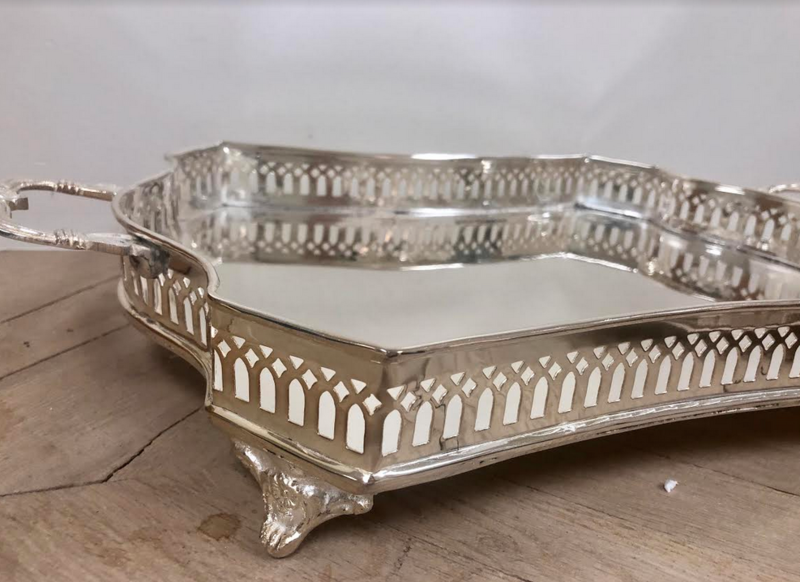 Love Item #12 the new silver tray. This is so versatile!! I love it all, but my favorite is the Julep cups. Of course for flowers or candles, but so pretty in a bathroom with make-up brushes. For a cocktail party they can hold nuts or candies, with a silver sugar shell to scoop!! The designs of these are sooo pretty. Thank you for finding such fun and beautiful items. Item #3 is my favorite! Two of these on my sideboard or dining room table would be so elegant! I love it all, but my favorite are the large candelabras! I want to set a fabulous table! Ohhhh! 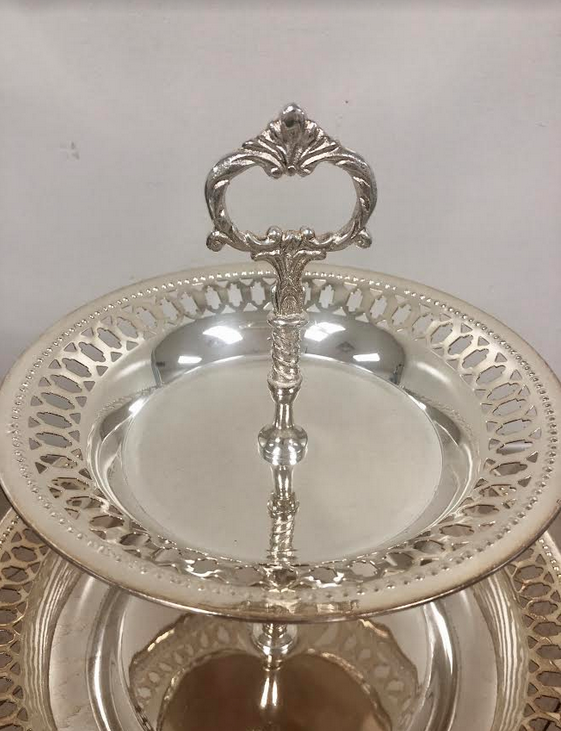 The two tiered silver server! I can imagine it with bon bons and tiny ornaments in the winter, and shells and pastries in the summer! What a versatile beautiful piece !!!! I’m just thinking how much I’d love to throw a fabulous party with all of this beautiful silver!! Drinks on the trays – check! Flower buds in mint julep vases everywhere – check! A table adorned with the candlesticks and mini-lamps at each setting – check and check! So hard to choose a favorite but I have to go with the beautiful serving tray. I’d love to put elegant finger sandwiches for high tea! Love the embossed mint julep cups! It’s all in the details! Hi! Love the mint julep cups. Very sweet and very useful! I really love the candlesticks in both sizes. I plan on using them on my dining room table. I want the back in stock planter. I am just now, for the first time, trying my hand at growing things! I have visions of beautiful paper whites in this gorgeous planter! Everything is gorgeous, but the silver lamp is my favorite. I would love to use those at every place setting, like I’ve seen in your pictures. I love item number 11- the planter/cooler! I’d use it as a Planter for my kitchen island. It’s all beautiful! 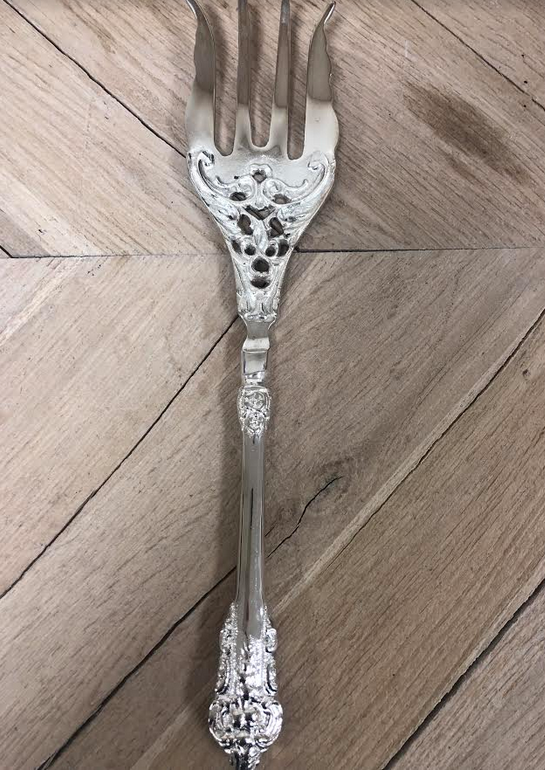 Those serving spoons and forks are so gorgeous! will blend in beautifully with other styles. 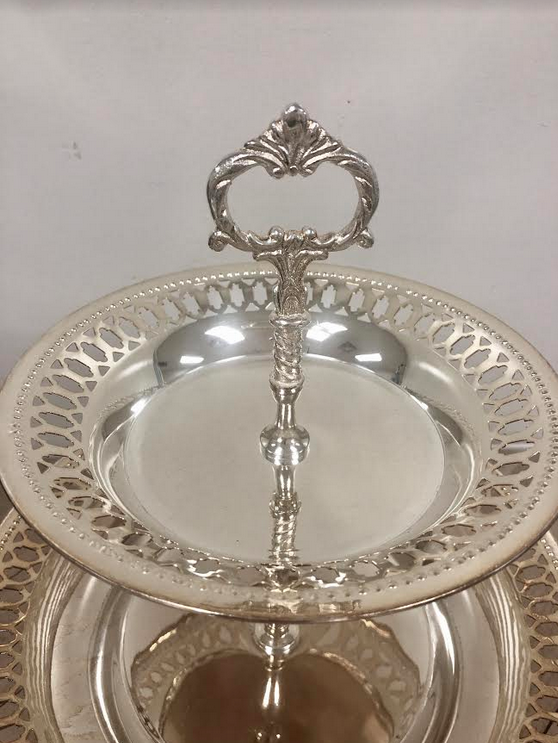 Have my eye on the beautiful two-tiered silver server for a spring luncheon I am planning! I’m a fan of the square mint julips! I just recently found your beautiful website. I so enjoy reading your articles and looking at the most beautiful pieces. As a matter of fact, I just placed my first order with your company. Thank you for bringing such beautiful items to our homes. #12. Absolutely with out question! 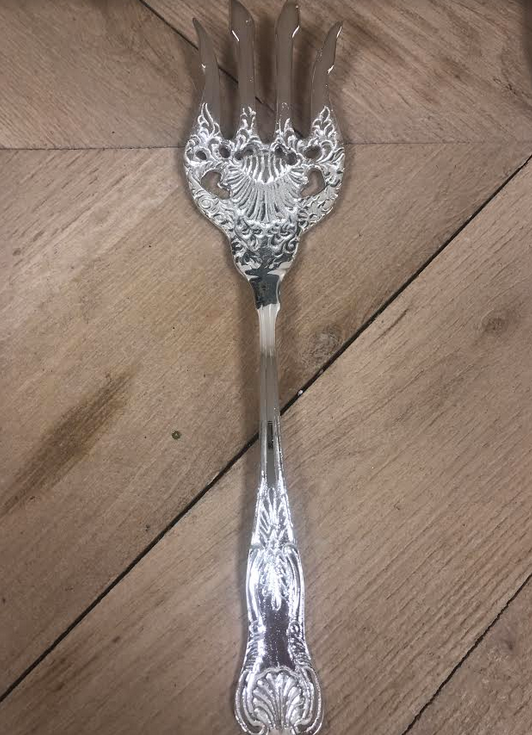 The most beautiful item…although all are fantastic and who doesn’t need silver in their life? Filled with orchids in the dining room on the sideboard, fabulous! Love this post! Everything is beautiful. I enjoy flower filled lined up mint juleps cups on our dining room table. I also love the large silver tub….. in the guest bath filled with rolled up towels. I love the trays and the candlesticks, they are beautiful! Love the beautiful trays l Would use on my bathroom vanity! One of each please! 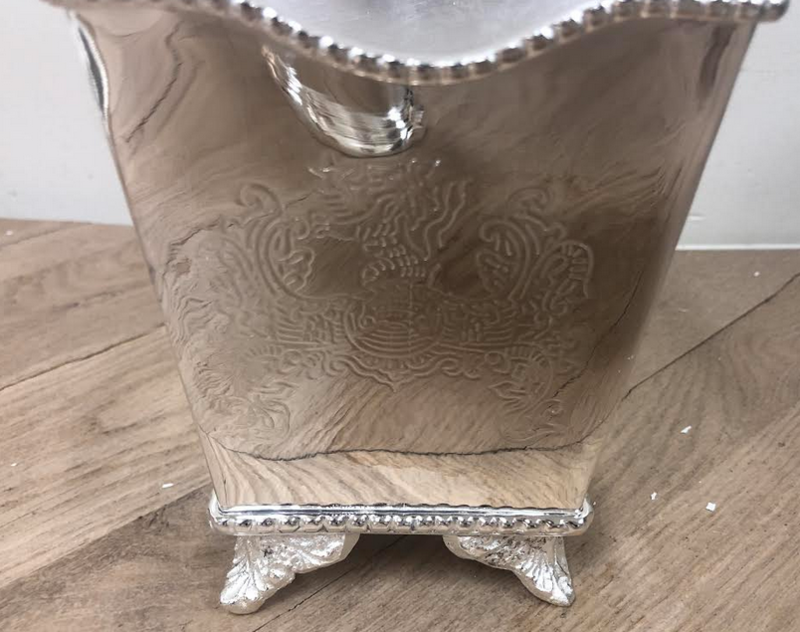 I own a few pieces of your silver and I love that they clean up beautifully and shine! Candle holders would look great on my dining room table. The silver pieces are lovely. Since I live in Louisville, the mint julep cups catch my eye. 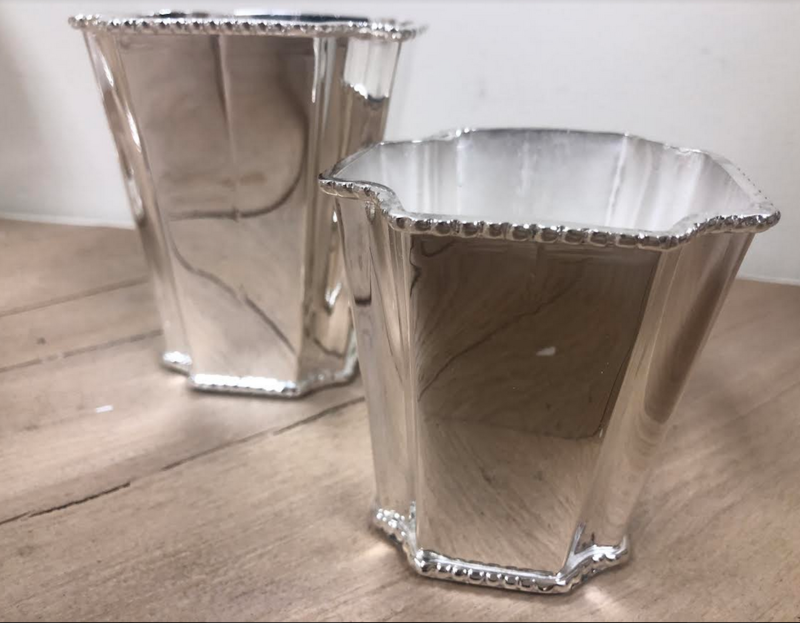 You can’t have too many beautiful julep cups for Derby. I also love the mini table lamps. I would love to use those on my dining room table. Mint Juleps I’d use not only to drink but as smini vases. I love every piece of silver in this post. But if I had to pick a favorite, I would chose the beautiful candelabras. Their height gives them a stateliness while the design gives a table a festive and inviting look. We host numerous dinner parties, so I will use them on dining room table. But what I am really looking forward to is the Thanksgiving feast we host under a large tent for about 60 people. These will be a gorgeous enhancement to the buffet table. 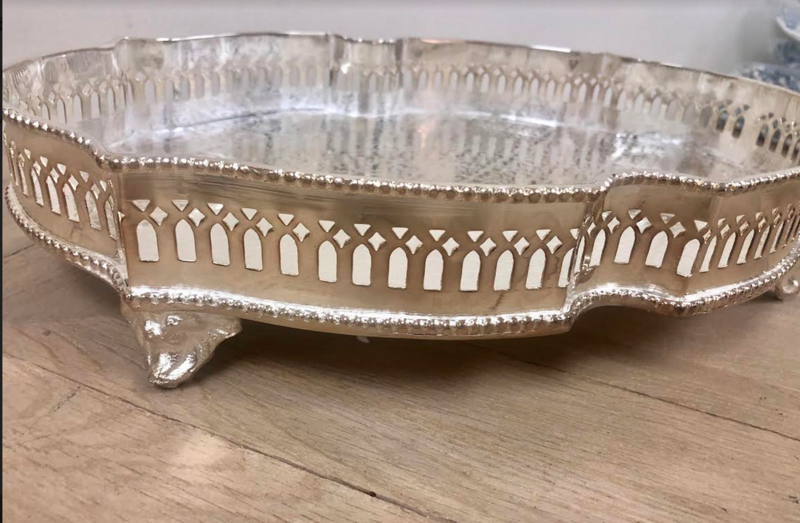 Silver trays are my favorite! So versatile. 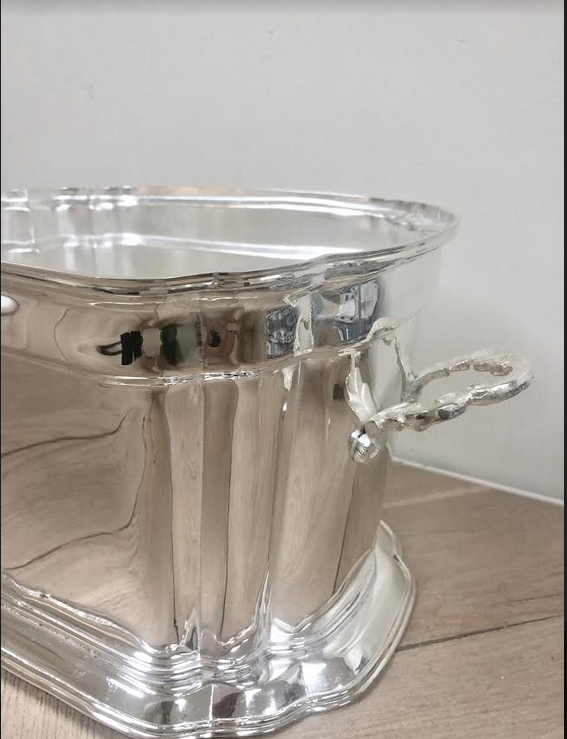 The silver beverage tub!! I actually ordered it and can’t wait to see it in my table for a baby shower!! 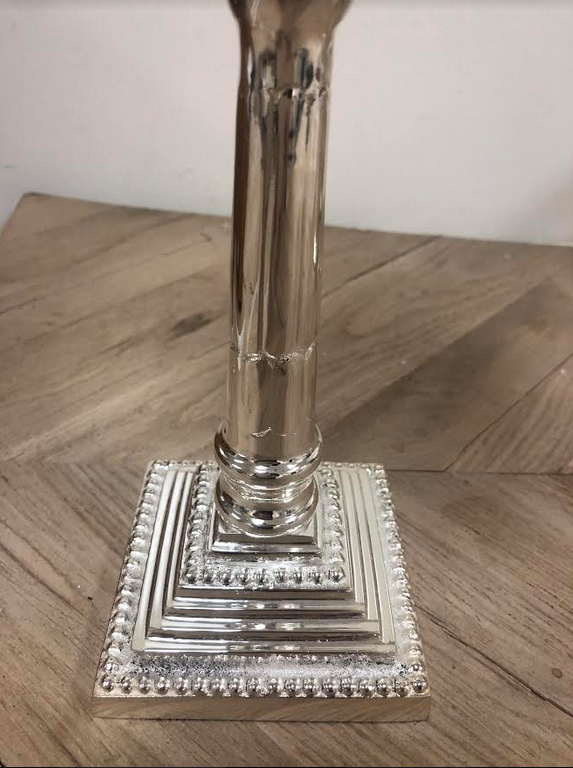 Love your two tiered silver server. So useful for small sandwiches for friends, or fruit, or especially for beautiful petit fours or other lovely desserts! Hungry just thinking about it! I must add another favorite, Item #14 candlesticks! How gorgeous would they be on my buffet. Love them! I love #11, filled with white petunias or a delicate fern. Love the candlesticks and beaded lamps! I use multiples of different votives and candles…makes a romantic table! 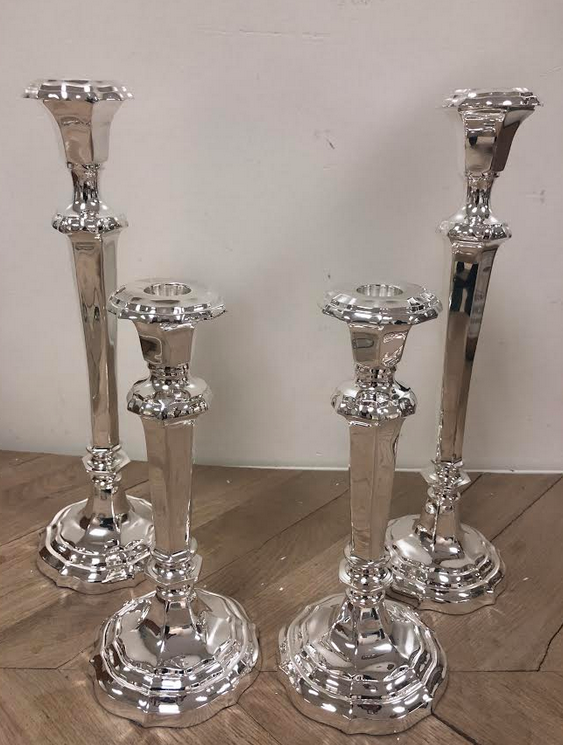 So hard to decide–love the candelabras and the candlesticks for my dining room table. 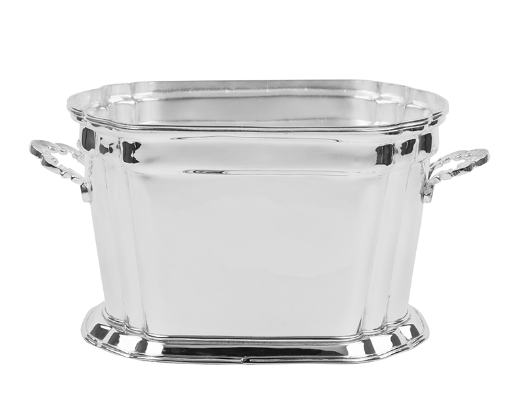 Also the 2 tiered silver server could be used for so many occasions. Beautiful! All of these are beautiful, but I would choose the mini table lamp and place one on my vanity and one on my 4 year old daughter’s vanity. I’d use LED candles of course! These candlesticks speak to the refined romantic era of the past yet the design is so simple and fluid they would enhance any environment today from a rustic outdoor setting to a celebratory special occasion. 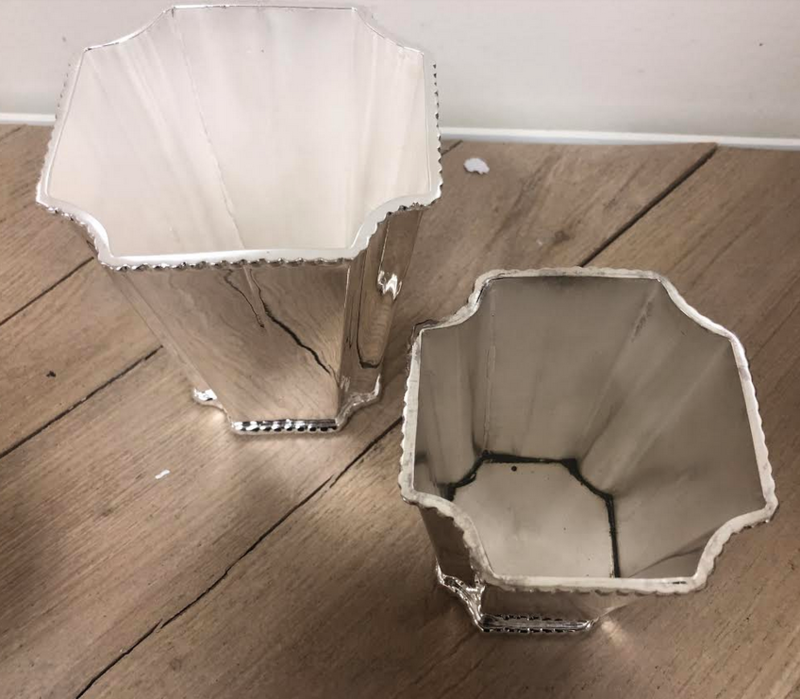 There is nothing like versatile silver candle holders. They will be with you for years. I love the beaded lamp! Just the right size and so elegant! The silver cooler!! It is spectacular and so elegant!